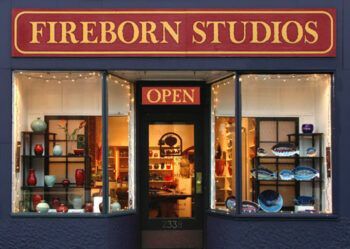 Visit us at Fireborn Gallery… where pottery, handblown glass, and jewelry by over 50 artists are on display. The pottery includes unique one-of-a-kind pieces, large showpieces, dinnerware and serving pieces, tea and sushi ware, mugs, bowls, sculpture, wall-hangings, and experimental designs and glazes. All sale items will have a colored sticker on them. The color of the sticker indicates what percentage off the regular price each item will be (i.e. pots with yellow stickers will be 20% off, blue stickers will be 30% off, and so on). We’ll have cards with each color’s corresponding markdown available for you to reference while you shop. We’ll also be having periodic “flash” sales on specialty items, such as our Raku wall tiles and framed prints, so keep an eye on your email inboxes for more information about those. If you aren’t already on our mailing list, please fill out the web from on the right hand side of your screen to be automatically enrolled. There are some excellent deals to be had, so don’t miss out! If you’ve been waiting to get your hands on a certain piece, now is an excellent time to take advantage of these deals. I have purchased beautiful unique pottery gifts from Fireborn Studios for years. Everyone I have given them to has loved them. I enjoy giving a one of a kind gift that will be used and enjoyed. 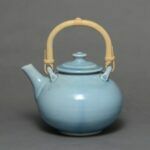 The glazes are extraordinarily gorgeous and varied. And there is always a wide selection that is changing all the time. You are sure to find something you like. I purchased a teapot years ago that I use every day. I love it as much today as the day I chose it! To see more reviews click here. How do simple, beautiful objects bind us together? Because objects obviously made and touched over time by one human, especially objects transferred to another human being, sometimes passed down from one generation to another, connect us to family and community and culture. The connection between artist, object and user is important. My work is always evolving, but recently it has been evolving faster than ever. That means LOTS of new, more colorful glazes. My latest work includes carved celadon platters, vases and pitchers, and large ash-glazed vessels. I just got back from a trip to North Carolina and I am feeling the influence of traditional forms, wood firing and large pots. I write to you from Cape Cod. Years ago I got a bowl with the name Fireborn scrawled into the bottom. A few weeks ago it slipped out of my hands while I was washing it and broke in the sink. It’s my favorite bowl. I know it probably sounds weird but this bowl inspired me to cook. I loved it. My daughter and I made cookies, breads, pancakes…everything and it brought me joy in the kitchen. It’s been a tough couple of years and this bowl breaking just devastated me. I’m hoping I can replace it somehow. I’m including a picture. After looking through everything on your site I guess it’s the Glacier glaze. The bottom of the bowl measured about 4.5 inches and the top probably about 12 inches and it was about 5 inches high. I hope I can replace this bowl. Can you please help?